A marked deck is a deck of cards with secret ink marks on the back, which can be easily identified by looking at the back of the playing cards. Once you know where the secret markings are, you can say every card from the decks. Any playing card tricks can potentially use a marked deck, it means that the playing cards printed by luminous ink can be used in cheating poker or magic tricks. Poker magicians use the deck to play magic card tricks, and some poker players use marked deck of cards to increase them winning odds. It is quite popular for poker players to use in Texas Holdem, Omaha, Baccarat card games. Different types of marks are used for different tricks. Marked deck tricks, it is very common in our daily poker life. If you play a lot of live poker card games, then you certainly have been involved in a playing card game in which the decks have been marked. if you know the tricks of marked deck playing cards, then you are surely able to do card marking work with years of experience and detect any magic marks on every cheating deck. The card tricks for marked magic deck are in a variety of ways. The most common form of marking deck is to put a nail mark in the deck, pressing the deck between the thumb and forefinger. Other methods include pressing corners, grease marks, dirt marks, etc. Some people also use the juice marked cards or ink to mark the decks by the printing machine, but this need the professional skills. The big advantage of the magic trick is that you can know which card will come out in the next turn. Marked deck, here we can be divided into 2 kinds: ultimate marked deck and the code marked deck. Ultimate marked decks are unique to be read by invisible ink contact lenses. We use the best card marking ink to make marked deck of cards and let the infrared marks be visible to the poker device, which is a better way to learn the secret decks. Ultimate marked deck is the most advanced and the most convenient types of marked playing cards, it is the most convenient to operate and it's accurate to recognize! These kinds of marked decks can only be recognized after you wear our special infrared contact lenses or luminous ink glasses, while human eyes cannot see them. A whole deck of invisible ink playing cards can easily be ‘doctored' fairly quickly. Although most online poker cheating devices would probably just mark the higher value cards. What is more, the playing card decks can be marked with bar code and cannot be detected by normal eyes or marked cards contact lenses. It can only be detected by our latest Texas hold'em scanner system and Omaha poker analyzer. We marked the playing cards on the sides, not the back, which we call side marks ( bar-code). The code marked decks are easy to use, just need the poker scanner system, then you can know the winning hands directly. Many poker players will choose the code marked deck, because they don't need to wear anything on their eyes, and also can get the best effects. 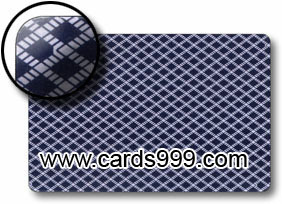 Cards999 has the special manufactured marked deck for sale. We are dedicated in making the best quality marked deck of cards poker and developing new and perfect poker cheating device, here all high quality poker products can be found in our online shop, such as Copag, Modiano, Fournier, Bicycle, Aviator, Bee, Spanish cards and so on, you can buy all marked deck playing cards magic online easily, any brand of magic decks that are characterized with the our printing machine cannot be detected with the human eye are for sale. We also have different kinds of marks on the back, the decks can be marked with luminous ink kit in the back pattern with big font in the middle, or four small fonts in the four corners. Also we accept customized marks, our professional technology staff can design the luminous marks according to your needs.